This is a review of the second edition of The Disneyland Encyclopedia (2012). Four years ago, I reviewed a book with a bright blue cover—the original edition of The Disneyland Encyclopedia by Chris Strodder. Now there’s an updated second edition. 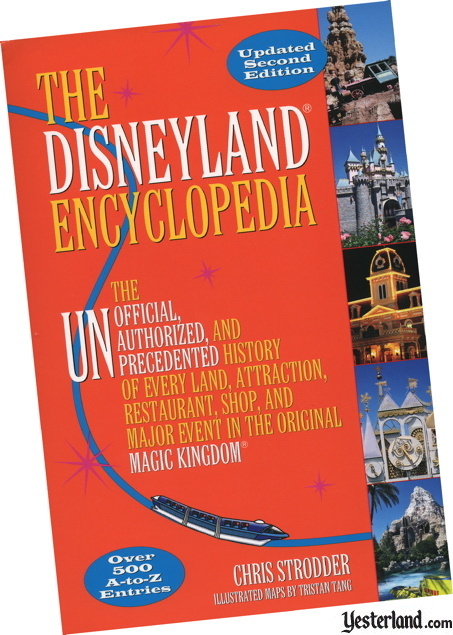 As in 2008, the new book’s subtitle promises a history of “every land, attraction, restaurant, shop, and major event in the original Magic Kingdom.” And, once again, Strodder seeks to deliver on that claim by offering more than 500 alphabetical encyclopedia entries cross-referenced to maps of each land. There are also numerous sidebars, appendices, a bibliography, and an extensive index. The A-to-Z section begins with an entry for Adventureland and ends with an entry for Zorro Days. Of course there are entries for everything you would expect, but you can also read about such oddities as the Miniature Horse Corral, the Bone Carving Shop, Jimmy Starr’s Show Business Souvenirs, and Sunny-View Farms Jams & Jellies. In addition to attractions, shops, and restaurants, there are broader entries such as Omnimover, Cast Member, Queues, and Trash Cans. There are even short biographies of key Imagineers and entertainers. Spanning the entire history of the park, from its founding more than 50 years ago to the present, this fascinating book explores over 500 attractions, restaurants, stores, events, and significant people from Disneyland. Sure, it’s a book cover sales pitch, but’s a very good description of what the book offers. Because you’re reading this online, you don’t have the benefit of being able to leaf though the book—so be aware the bullets about “over 300 new photos” and “more historic photos” do not mean that this is some sort of coffee table picture book. The images are small (usually around two by three inches) and black-and-white. That’s not a criticism, but just something you should know. The changes in the updated second edition go well beyond the bright orange cover and 24 additional pages. As you would expect, there are new entries for places that did not yet exist in 2008, such Bibbidi Bobbidi Boutique (2009 - ), Troubador Tavern (2009 - ), Jolly Holiday Bakery Café (2012 - ), and Fantasy Faire (2013 - ). 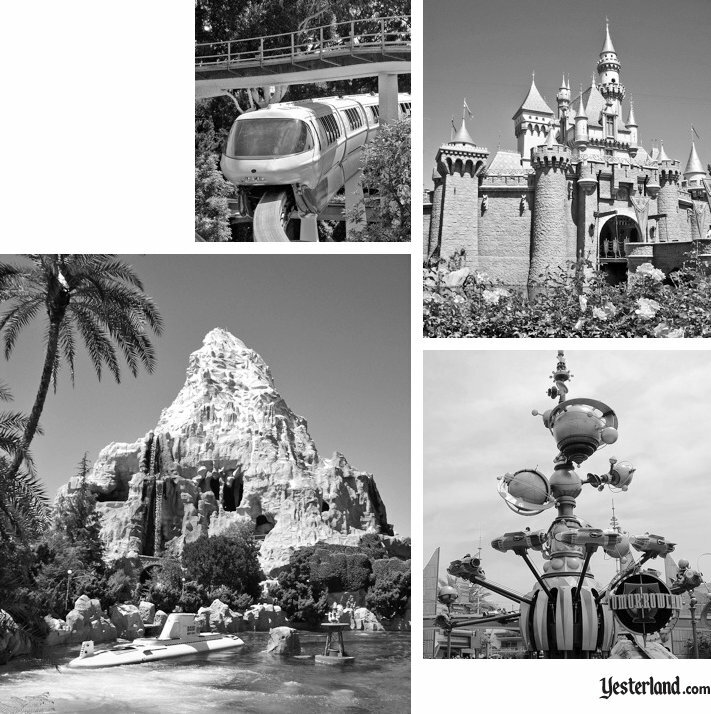 Strodder has also added entries that could have been in the 2008 book but weren’t, such as the “40 Years of Adventure” promotion, the proposed movie Khrushchev in Disneyland (about the Disneyland visit denied to the Soviet leader), and the Magic Kingdom Club. Strodder used the second edition as an opportunity to take another look at all entries from the original edition. Many have been revised, sometimes with just a few words changed, and sometimes with substantial rewriting and updating. Some entries have been split or combined more logically. Imagineers Marc Davis and Alice Davis now each have their own entry, instead of being lumped together. Rocket to the Moon (1955-1966), Flight to the Moon (1967-1975), and Mission to Mars (1975-1992) each have a separate entry, instead of the first two being combined. In other cases, attractions are combined in a single entry. The tiny, 11-screen Circarama theater (1955-1967) and the large, 9-screen Circle-Vision 360 theater (1967-1997) are both in the same entry (Circarama). But the theaters occupied different spaces, used different technology, had different names, and showed different films. Although both showed films called America the Beautiful, these were different films. I assume Strodder’s logic for combining the two theaters in a single entry is that the older one evolved into the newer one. There’s also the whole matter of what Strodder chose to include and to omit. Readers might be puzzled by some of Strodder’s choices. But he’s the author, so the book reflects his priorities. The accuracy of the book seems very high. No, I didn’t double-check every fact and date, but I came away with the feeling that Chris Strodder was diligent in his research. Even the best-researched books can miss a few things. The entry about “Martin, Bill (1917 - )” should be “Martin, Bill (1917 - 2010).” The PeopleMover entry describes how the ride went “through the waiting area of the Circarama theater.” Well, technically the PeopleMover provided a view into the waiting area and pre-show of Circle-Vision 360, not of Circarama. The Circarama entry describes how, in early 1967, “America the Beautiful was also revised to include two minutes of new footage, the number of screens went from eleven to nine larger screens, and the pre-show area was radically reworked.” It was actually an entirely new America the Beautiful film, not just two minutes of new footage added to the old one. And it was not just a case of the old pre-show area being reworked; the 1967 configuration put a pre-show and waiting room into the space that had previously been the Circarama theater and the sponsor’s exhibit room. Please don’t read the paragraph above as casting doubt on the overall accuracy of the book. Being 100% accurate in a work that tries to put together obscure details from up to 57 years ago is an impossible standard. The real achievement is having 57 years of Disneyland history in one book. That was my recommendation then—and the book is now even better. The list price is still $19.95 U.S. / $21.95. The price is the same as four years ago—which certainly can’t be said for Disneyland admissions and annual passes. Chris Strodder works in Marin County schools and libraries. He is the author of The Encyclopedia of Sixties Cool, Swingin’ Chicks of the ’60s, the young adult novels Lockerboy and The Wish Book, and a collection of short stories, Stories Light and Dark. He lives in Mill Valley, California. 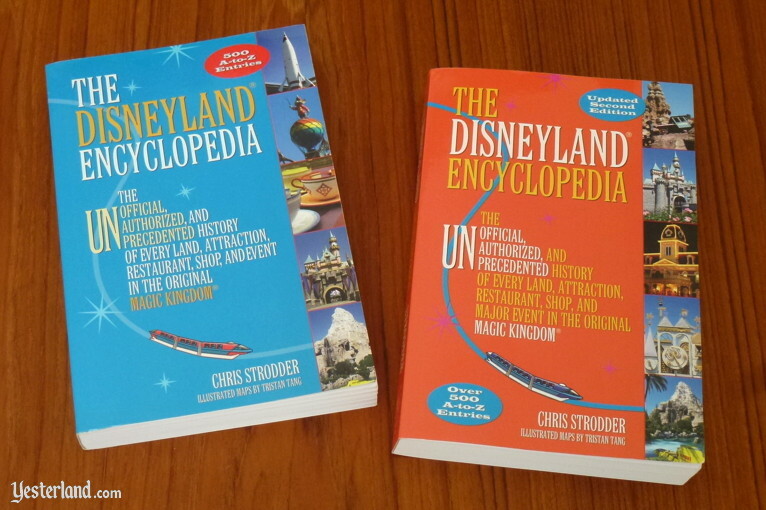 The Disneyland Encyclopedia, 2nd Edition, by Chris Strodder is available from Amazon. It’s surprisingly inexpensive, especially at the discounted Amazon price. You can also order this book by calling Santa Monica Press at 1-800-784-9553. Or visit your local bookstore (any bookstore can order this book from its preferred distributor or wholesaler). 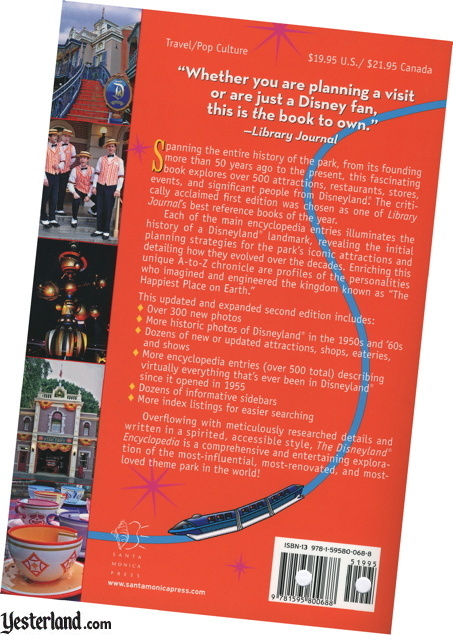 Image of front and back cover of The Disneyland Encyclopedia by Chris Strodder: Courtesy of Santa Monica Press. Disclosure per FTC guidelines: Werner Weiss was sent a copy of the book The Disneyland Encyclopedia for review. Mr. Weiss does not receive any financial consideration from Santa Monica Press or the author of the book.